FORT LAUDERDALE, Fla. — Ayauna King-Baker loved Ben Carson’s “Gifted Hands” memoir so much that she made her daughter Shaliya read it. So when Carson showed up in town to sign copies of his new book, King-Baker dragged the giggly 13-year-old along to the bookstore so they could both meet him. Bell, the Northeastern professor, said Carson’s celebrity may have helped him at the beginning of his candidacy, but that shine may have worn off. Left: U.S. Republican presidential candidate Ben Carson speaks at a campaign event in Pahrump, Nevada November 23, 2015. 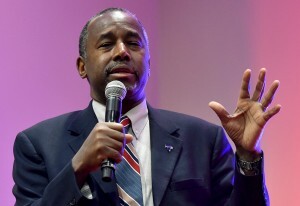 Many African-Americans say they see two different - and at times conflicting - sides of Carson. Photo by David Becker/Reuters.